Research done by profession researchers for people and companies who pay for the research (I just borrow the results) strongly suggests that if we have to go more than five minutes out of our 'zone' to get to a workout place, we will not develop the habit without pushing, prodding, and various death threats. The researchers probably did not say 'death threats' but you get the idea. Those of us who are not natural lovers of sweat, body work and aching muscles are not naturally going to develop a long-term commitment to exercise without a good reason (like warding off death threats). Anyway, that is why I purchased the equipment off a defunct fitness business in 2006 I knew the research and I did not want to lose the progress I acquired just because the place in my 'zone' was closing the next next one was further away. You must understand: I did not like exercise, I hated working out or getting sweaty for the purpose of a workout and this meant I had no excuse to skip a work out ever again. Not only that, I went into debt to buy the damn stuff! Best thing I ever did. Six years later I am still using it. It is paid off and it pays me back in extra years to live a good life. I have build some great sweat equity. The only drawback is my husband's car does not fit with mine in the garage (of course, there is still room for my car. . . I'm not crazy). Since hubby gets to use the equipment too, he does not complain, or at least, not where I can hear him. Best money I ever spent outside of Botox (don't judge). Speaking of Botox (and I was), I have not had any in over a year. I need a treatment on my brows so I can look less angry in sunlight.Then last night I saw the finale of the TV series House, MD. Sela Ward came back to reprise her role as a past girlfriend. I could not get over how much product must be under the skin on her face. The upper half of her face had no movement whatsoever. I do not have the kind of money that lets me buy unlimited Botox units so I think my face is safe from that kind of "just a little more" thinking,. - at least until I win the lottery. What is the best investment you have made in your physical fitness plan? I saw the Sela clip you mean and thought there was something very odd about the filming. Like maybe she was green screened into the scene and wasn't actually on set. There are LOTS of closeup of her on CSI New York and I never think her face looks odd on that show. I drive about 10 miles to my exercise and yoga and pilates classes. I get there pretty much no matter what, I schedule my life around it. Now, Tuesday and Thursday, I do 2 one hour classes back to back to make it worth the trip. On other days I make the same trip loga or other classes. I work harder with an instructor. I do better in classes. I am not out and about (working) like you are. These classes are a big part of my socialization. And I do much better with a schedule. We have an elliptical at home, but I am currently grounded from using it. I struggle to get at home exercise done. Struggle to make it part of the routine. This has really been brought to my attention as I am having a hard time getting my Balance Physical Therapy DONE this week. I am not trying to avoid it, I just simply don't seem to think of it. Until something becomes a habit or a priority I think we all struggle.You work hard to be very aware of what works for you and I know you will get it figured out for this balance issue you are working through now. Walking has been my first love since I started this journey so I guess my best investment would be in shoes :) But I do like my gym too and go several times a week so that small amount of money is worth it to both Mike and I. The plastic surgery wasn't for "physical fitness" but I have to say I don't regret it. See, I must be a weirdie. I'm the opposite. 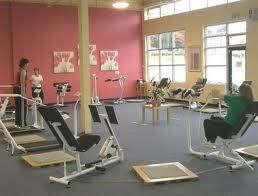 I can have all kinds of stuff here to do but I do best when I can drive to the next town and pay $5 to use the gym. Maybe that is because that is one of my only kid free times. I mess up all the good research. :) Like I said, I'm a weirdie. I think the elliptical I bought for the house when I was about two months into my new life was a great investment. It's a bottom of the line model but it got 60 pounds off me and I still use it at least once a week on days I can't get to the gym. Working with qualified, supportive personal trainers has also been well worth the money and even after I'm certified as a trainer myself, I will continue to be a client. Botox is on my radar some time in the future... :) For now I just wear my bangs longer. Best investment in my physical fitness plan is a toss up between my iPod, and good running shoes. I have the same experience as you, where if I have to go out of my way eventually I'll stop bothering, so just putting on shoes, my iPod and heading out my door to run is the best exercise for me ever. No matter what else I dabble in, running is my baseline, go-to exercise because I literally don't need anything more than a pair of shoes to make it work. I do, however, splurge on really nice running headphones, can't stand those little earbuds for running.